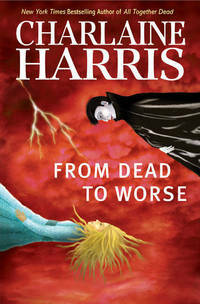 From Dead to Worse is the eighth full-length novel in the Sookie Stackhouse series by popular American author, Charlaine Harris. Sookie attends the society wedding of the year, expecting to go as a guest, but ending up as a bridesmaid and a barmaid. Enlisted for her telepathic powers, Sookie's efforts to reconcile opposing factions of the Shreveport weres deteriorate into a battle that sees many dead. She also finds herself in the middle of a hostile takeover of the Louisiana vampires, a takeover that results in several of her vampire friends permanently dead. Spells are cast, a killer exposed and a fledgling relationship ends. Sookie breaks a finger (but not one of hers), does a bit of mediating and saves quite a few lives. There are several attempts on her life by the end of this instalment, so Sookie is surprised and rather satisfied to find herself now under the protection of three powerful individuals. And after her brother Jason's disappointing behaviour, Sookie is pleased to learn she has two more living relatives of whom she was unaware. Questions remain unanswered so there's plenty to be going on with in the next book, Dead and Gone, but the last few pages will warm the heart of the most cynical reader. Another entertaining read. 2008-03-08. New. Ships with Tracking Number! INTERNATIONAL WORLDWIDE Shipping available. Buy with confidence, excellent customer service! 2010-02-04. New. Ships with Tracking Number! INTERNATIONAL WORLDWIDE Shipping available. Buy with confidence, excellent customer service! 2008-07-06. New. Ships with Tracking Number! INTERNATIONAL WORLDWIDE Shipping available. Buy with confidence, excellent customer service! 2011-10-01. New. Ships with Tracking Number! INTERNATIONAL WORLDWIDE Shipping available. Buy with confidence, excellent customer service! Ace. Used - Like New. Like New condition. Like New dust jacket. 2010-07-09. New. Ships with Tracking Number! INTERNATIONAL WORLDWIDE Shipping available. Buy with confidence, excellent customer service! 2009-01-05. New. Ships with Tracking Number! INTERNATIONAL WORLDWIDE Shipping available. Buy with confidence, excellent customer service! 2009-01-01. Good. Ships with Tracking Number! INTERNATIONAL WORLDWIDE Shipping available. May not contain Access Codes or Supplements. May be ex-library. Shipping & Handling by region. Buy with confidence, excellent customer service! 2011-10-01. Good. Ships with Tracking Number! INTERNATIONAL WORLDWIDE Shipping available. May not contain Access Codes or Supplements. May be ex-library. Shipping & Handling by region. Buy with confidence, excellent customer service! New York: Ace Books, 2008. Signed by Charlaine Harris on the title page. Signature only. Received in person. A First edition, First printing. Book is in Fine condition. Boards are clean, not bumped. Fore edges are clean. Interior is clean and legible. Not remaindered. Dust Jacket is in Fine condition. Not chipped or crinkled. Not price clipped. Dust Jacket is covered by Mylar Brodart. Thanks and Enjoy. All-Ways well boxed, All-Ways fast service. Thanks.. Signed by Author. First Edition. Hard Cover. Fine/Fine. Ace Books. MASS MARKET PAPERBACK. 0441017010 New Condition. . New. Ace. PAPERBACK. 0441018327 New Condition. . New. 2008-03-08. Good. Ships with Tracking Number! INTERNATIONAL WORLDWIDE Shipping available. May not contain Access Codes or Supplements. May be ex-library. Shipping & Handling by region. Buy with confidence, excellent customer service! 2010-07-09. Good. Ships with Tracking Number! INTERNATIONAL WORLDWIDE Shipping available. May not contain Access Codes or Supplements. May be ex-library. Shipping & Handling by region. Buy with confidence, excellent customer service! 2008-07-06. Good. Ships with Tracking Number! INTERNATIONAL WORLDWIDE Shipping available. May not contain Access Codes or Supplements. May be ex-library. Shipping & Handling by region. Buy with confidence, excellent customer service! East Rutherford, New Jersey, U.S.A.: Ace Books, 2008. Book. Near Fine. Hardcover. Signed by Author(s). 1st Edition. An Excellent Copy - Signed By Charlaine Harris On The Title Page. Signed Only And In Person. A First Edition, First Printing. Book Is In Near Fine Condition. Boards Are Clean, Not Bumped. Fore Edges Have A Tiny Bit Of Shelf Wear. Interior Is Clean And Legible. Not Remaindered. Dust Jacket Is In Near Fine Condition. Not Chipped Or Crinkled. Not Price Clipped. Dust Jacket Is Covered By Mylar Brodart. Thanks And Enjoy..
U.S.A.: Ace, 2008. Book. Near Fine. Hardcover. Signed by Author(s). 1ST. An Excellent Copy - Signed For Fred - By The Author On The Title Page. Comes With A Limited Short Story By Terry Hertzler. A First Edition, First Printing. Book Is In Near Fine Condition. Boards Are Clean, Not Bumped. Fore Edges Have A Tiny Bit Of Shelf Wear. Interior Is Clean And Legible. Not Remaindered. Dust Jacket Is In Near Fine Condition. Not Chipped Or Crinkled. Not Price Clipped. Dust Jacket Is Covered By Mylar Brodart. Thanks And Enjoy..
New York: Ace, 2008. SIGNED by the AUTHOR on the Title page. Signature only A First edition, First printing. Book is in Near Fine condition. Boards are clean, not bumped. Fore edges have a tiny bit of shelf wear. Interior is clean and legible. Not remaindered. Dust Jacket is in Near Fine condition. Not chipped or crinkled. Not price clipped. Dust Jacket is covered by Mylar Brodart. Thanks and Enjoy. All-ways well boxed, All-ways fast service. Thanks.. Signed by Author. First Edition. Hard Cover. Near Fine/Near Fine. Britain: Gollancz, 2008 #8 in Sookie Stackhouse Series Signed at Polaris 2011 Harris outdoes herself, packing the story full of romantic tension and supernatural action. **Oversize & Heavy Items may require additional postage. 2010-02-04. Good. Ships with Tracking Number! INTERNATIONAL WORLDWIDE Shipping available. May not contain Access Codes or Supplements. May be ex-library. Shipping & Handling by region. Buy with confidence, excellent customer service! Ace. Hardcover. 0441015891 New Condition *** Right Off the Shelf | Ships within 2 Business Days ~~~ Customer Service Is Our Top Priority! - Thank you for LOOKING :-) . New. Ace. Hardcover. 0441015891 Signed by Charlaine Harris. 1st Edition Book is in like new condition. Customer service is our #1 priority. We sell great books at cheap prices. . Fine. Ace. PAPERBACK. 0441018327 Like New Condition. . Fine. Ace Books. MASS MARKET PAPERBACK. 0441017010 Like New Condition. . Fine. ACE. Hardcover. SIGNED American first edition, first printing. Signed on the title page by author. Published by ACE Books in 2008. Contains numberline 1 2 3 4 5 6 7 8 9 10. The jacket is in Very Good + condition. Minor wear to spine ends and edges of jacket. Light scratching to back of jacket. Jacket is NOT price clipped. Covers are clean and bright. Edges are sharp. No tears. The book itself is in Fine condition with no bumps or marks. The binding is straight and tight. NO remainder mark. Oversize and heavy items may require additional postage. ; Signed by Author All books are marked down 35% until February 1, 2019. Start stocking up now! . Very Good. 2008. First Edition. Ace. Hardcover. 0441015891 Please allow 4 - 14 business days for Standard shipping, within the US. Thank you for supporting our small, family-owned business! . Fine. 2008-05-06. 1. Ace. Hardcover. 0441015891 Please allow 4 - 14 business days for Standard shipping, within the US. Thank you for supporting our small, family-owned business! . New. 2008-05-06. 1. Wheeler Pub Inc. Hardcover. 1597227773 Please allow 4 - 14 business days for Standard shipping, within the US. Thank you for supporting our small, family-owned business! . Fair. 2008-08-06. Large Print. Ace. Hardcover. 0441015891 Please allow 4 - 14 business days for Standard shipping, within the US. Thank you for supporting our small, family-owned business! . Fair. 2008-05-06. 1. Ace Books. Mass Market Paperback. 0441017010 Please allow 4 - 14 business days for Standard shipping, within the US. Thank you for supporting our small, family-owned business! . Fine. 2009-03-31. 1st. Ace Books. Mass Market Paperback. 0441017010 Please allow 4 - 14 business days for Standard shipping, within the US. Thank you for supporting our small, family-owned business! . New. 2009-03-31. 1st. Ace Books. Mass Market Paperback. 0441017010 Please allow 4 - 14 business days for Standard shipping, within the US. Thank you for supporting our small, family-owned business! . Fair. 2009-03-31. 1st. New York: Ace Books, 2008. This is the eighth novel in the Sookie Stackhouse series, a.k.a. the Southern Vampire series. It is a Stated First Edition from May 2008 and includes the complete "number line" ending with a "1" to indicate First Printing. The book is in Fine condition but with a small erasure mark on the front endpaper. The price-unclipped dust jacket is also in Fine condition. I've placed the dust jacket into an archival Brodart protective sleeve. This novel follows the explosion at the vampire summit in Rhodes and new threats to Sookie's life and to those of her friends in the supernatural community. Readers get to meet cousin Hadley's son Hunter, only a child but one who shares Sookie's telepathic abilities. The book measures 6 1/4 by 9 1/4 inches and includes 359 pages. . Stated First Edition. Hard Cover. Fine/Fine. 8vo - over 7¾" - 9¾" tall. Ace Trade, 2010-03-02. Reprint. Paperback. Used:Good. Ace Trade, 2010-02-02. Reprint. Paperback. Used:Good. Turtleback Books, 2009. Library Binding. Very Good. Disclaimer:A copy that has been read, but remains in excellent condition. Pages are intact and are not marred by notes or highlighting, but may contain a neat previous owner name. The spine remains undamaged. At ThriftBooks, our motto is: Read More, Spend Less.Dust jacket quality is not guaranteed. NEW YORK: ACE BOOKS. VG/VG TEAR TO DJ FRONT. Pages: 359. . 2008. 1ST. HARDCOVER.. Condition: VG/VG TEAR TO DJ FRONT. Pages: 359. N. Y.: Ace Books, 2008. hard cover is in fine condition as is the dust jacket. is a stated first edition, first printing. copy is unmarked and tightly bound. 359 pages.. First Edition. Hard Cover. Fine/Fine. 8vo - over 7¾" - 9¾" tall. Recorded Books, 2008. Audio Book. Good. Audio CD. 9 AUDIO CDs withdrawn from the library collection. Some library marking. We polish each Audio CD for good listening. You will receive a reliable set. Enjoy this worthwhile AUDIO CD performance..
PLAYAWAY, 2008. Audio Book. Good. preloaded_digital_audio_player. PLAYAWAY ** DIGITAL AUDIO PLAYAWAY EDITION ** withdrawn from the library collection. A PLAYAWAY is a Compact Digital Audio Player already pre-loaded with your audio book. PLAYAWAY IS EASY TO USE! Just plug in the earphones, press the power button ON and begin to listen and enjoy. Included is a NEW BATTERY and NEW EARBUDS. Light weight with a powerful purpose. Take along on your next journey. Makes a sensitive get well gift! Enjoy the convenience and versatility of the PLAYAWAY for all your travel and leisure needs.. ACE. New. 6.88 x 4.24 cm. New York: Ace Books, 2008. The 8th Sookie Stackhouse novel.. 1st Printing. Hard Cover. Near Fine/DJ Near Fine. Large Octavo. New York: Ace Books, 2008. The 8th Sookie Stackhouse novel.. 1st Printing. Hard Cover. Fine/DJ Fine. Large Octavo. New York: Ace Books, 2008. The 8th Sookie Stackhouse novel. Lisa Desimini dust jacket.. 1st Printing. Hard Cover. Near Fine/DJ Near Fine. Large Octavo. New York, New York, U.S.A.: Ace Books, 2008. Very good hardcover, very good dust jacket. Hard Cover. Very Good/Very Good. New York: Ace Books, 2008. The 8th Sookie Stackhouse novel.. 1st Printing. Hard Cover. Near Fine/DJ Near Fine. Octavo.